Early in the 2010 season, it appeared that Robert Kubica’s stay with Renault would be short-lived. The team was struggling to put a competitive car on the track and Kubica’s name was being linked to several possible open seats. But with both Mark Webber and Felipe Massa agreeing to return to Red Bull and Ferrari for the 2011 season and Kubica’s performance improving, it’s little wonder that the Polish driver is apparently ready to commit to Renault in the long term. 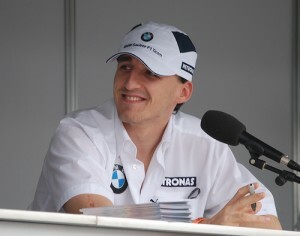 Autosport.com reports that Kubica is set to exercise his option to stay with the team through the 2011 season. He is also ready to commit to the team beyond 2012 if he feels that they show a commitment to the sport and that they have the financial and technical strength to be competitive with top teams like Red Bull, McLaren and Ferrari. One factor which might influence Kubica’s decision is the potential for Renault to sign a major sponsorship deal which would bring in much-needed money to the team and allow them to increase their research and development. Rumors have circulated that a deal with Mastercard might be imminent.